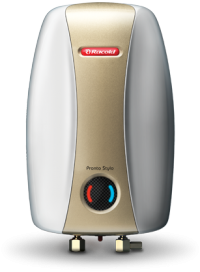 This Racold Pronto Stylo geyser water heater is 1L Capacity. This Pronto Stylo comes with an attractive Italian Design and Rust Proof outer body, ensuring a longer product life. The high density and thick PUF ensures retention of internal heat & temperature, resulting in better energy efficiency & reduced electricity bills.Its high pressure withstanding capacity (6.5 bar) makes it suitable for high rise buildings and high pressure pump applications. The Provides three levels of safety against high temperature & pressure with cutout, thermostat and safety valve. To Recieve updates and possible rewards for Racold Pronto Stylo 1L - 4.5KW please sign in. To Recieve updates and possible rewards for Geyser/Water Heater please sign in.